Our ultimate goal is to make sure all of our guests and program participants are housed – because nobody should be homeless. Whenever possible, Father Bill’s & MainSpring works with individuals and families to prevent them from losing their housing. And for those who are experiencing homelessness, we seek solutions to get them back into stable housing as quickly as possible. If you’re in need of any of the services listed below, visit our Get Help page to see how we may be able to help. Father Bill’s & MainSpring has three regional housing offices (Quincy, Brockton, Plymouth), dedicated to supporting formerly homeless individuals living in housing. Most individuals in PSH are those with disabilities and/or those who have previously been homeless for a significant period of time, and would have difficulty accessing or maintaining mainstream housing. All PSH tenants pay 30% of their income as rent. They are assigned a case manager who helps ensure participants are accessing the services they need to successfully remain housed. FBMS operates approximately 500 units across Southern Massachusetts. We are also a provider of Pay for Success, a program that aims to house the most vulnerable individuals who are frequent visitors to emergency rooms and acute-care facilities. With the stability provided by permanent housing, coupled with the supportive services that assist individuals in accessing primary care, this innovative model benefits taxpayers by cutting down on long-term healthcare costs accumulated by individuals who had previously relied heavily on publicly funded emergency resources. It’s always the goal of Father Bill’s & MainSpring to quickly ‘re-house’ individuals whenever possible. FBMS administers short and medium term rental assistance through the Emergency Solutions Grant. We also have resources targeted to young adults between ages of 18-24 who are experiencing homelessness. A portion of our 500 permanent supportive housing units are directed to families. All PSH tenants pay 30% of their income as rent. They are assigned a case manager who helps ensure participants are accessing the services they need to remain housed successfully. Families who are eligible for state Emergency Assistance are usually also eligible for funds to stabilize their housing situation through HomeBASE. The program provides funds to help families experiencing homelessness to avoid shelter and instead secure housing. HomeBASE is a highly flexible re-housing resource that helps families secure the housing situation that best meets their needs. 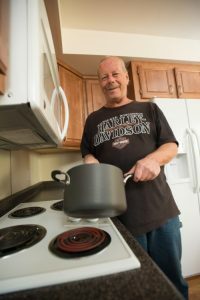 Some of the 500 Permanent Supportive Housing units operated by Father Bill’s & MainSpring are dedicated to veterans, including 8 units at the Sheila McIntyre House in Quincy and 6 units at the Commander Paul F. Anderson House in Hingham, and 6 units at a new property in Weymouth, which opened in July 2017. Veterans preference is given for 10 units at the recently opened Jack’s Place in Brockton. We help veterans regain housing by connecting them with SSVF benefits, which are administered by the U.S. Department of Veterans Affairs and programs such as Volunteers of America. The SSVF program provides temporary financial assistance to eligible veterans for expenses such as rent, utility, and child care, and can help veterans retain their current housing or find new housing quickly.